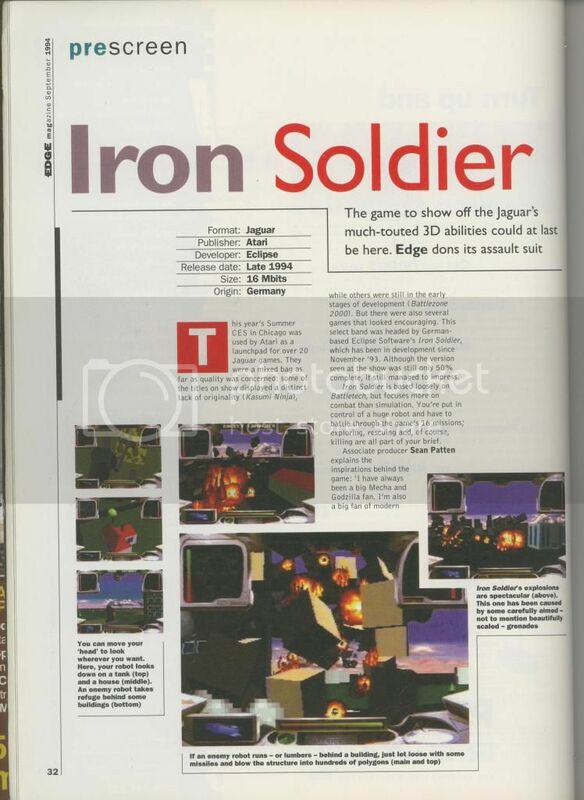 A.Producer on Iron Solider chatting about the game. The planned Jaguar PC card. Jeff Minter talking about what 'Extra's' he'd put on Defender 2000 IF it went on CD. 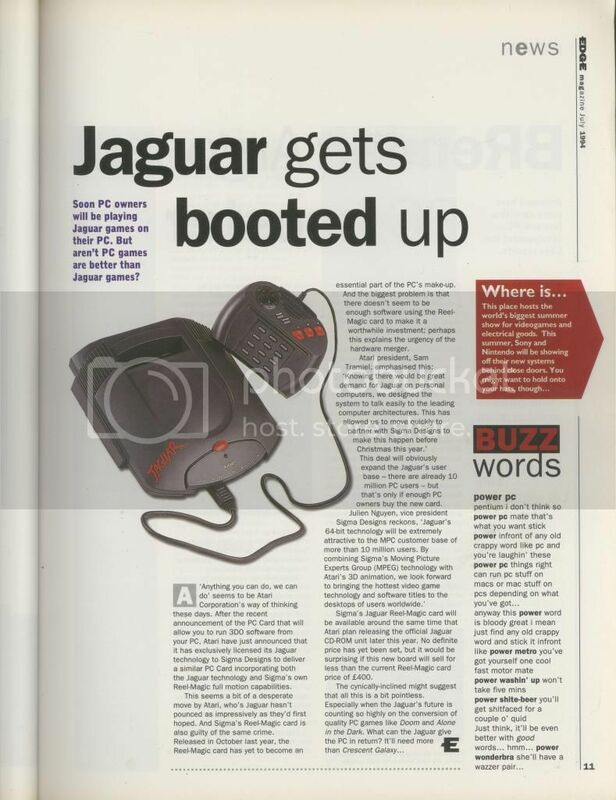 Just realised i'd not sent P2 of the Jag CD article (Minter quotes) so that'll appear at later date. Just forwarded it to H.Voltage now. 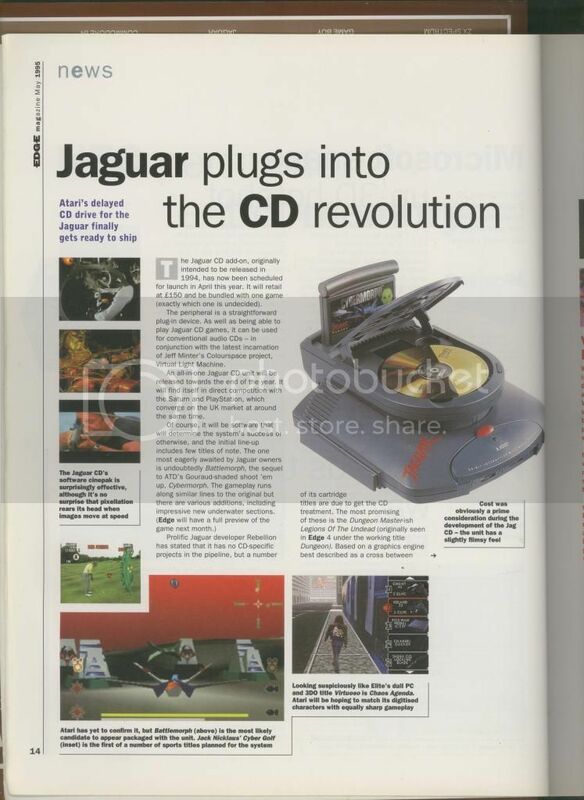 That list of Jaguar CD games and claims Rebellion were putting certain games of theirs on CD has been proven to be a bit wide of the mark. Rebellion themselves have said they had no idea where Edge got it's info from. Plus, High Voltage, you wrote in and corrected them on certain points raised in an Atari related article, did you not?. wow I don't even remember that (only got half of my Edge collection left). But, did I know any better? :-) Issue 21:June'95 my friend. YOU corrected Edge regarding Bushnell producing home versions of arcade machines long before the VCS, ie Super Pong. Edge admit your right they were wrong. 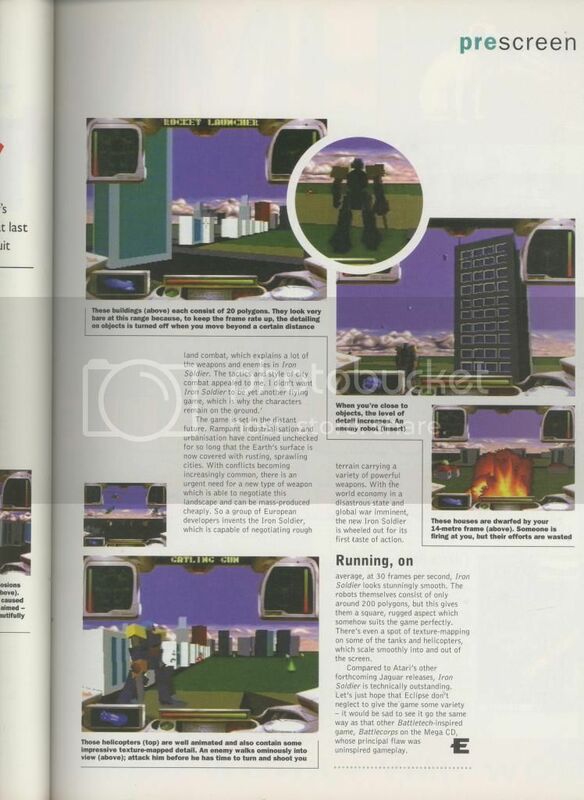 Edge sort of 'bluffed' their way out of the 7800 issue you raised, claiming they did'nt say it was'nt unsuccesful, only that it was was way behind the NES in terms of sales, but then so was every other comsole of that era. 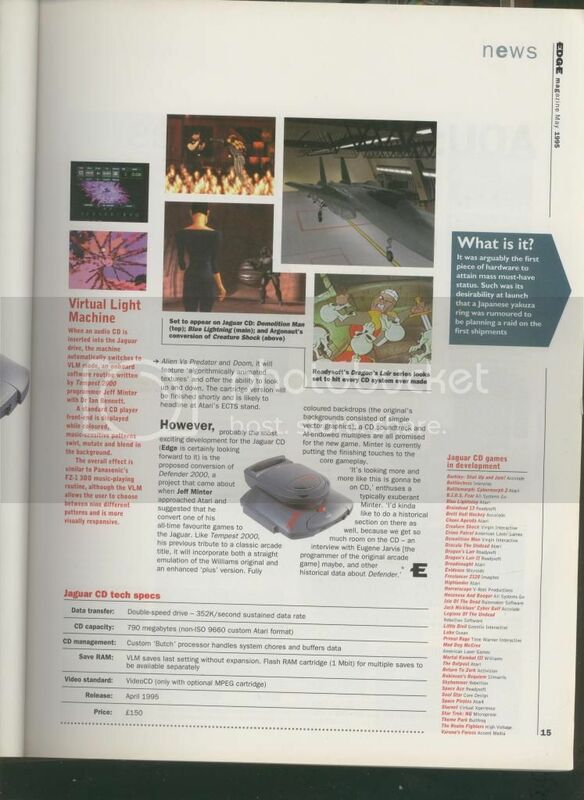 They said they did'nt have space to cover all of Atari's history (that would have needed 20 pages or so) so, no, they did'nt cover the Atari/Lucasfilm aspects, article was intended to cover 'Atari's fluctuating fortunes' instead. So, that's you and Darryl Still that corrected Edge on it's Atari reporting. It always pissed me off that the British gaming industry (including gaming mags) were so unknowledgable about the USA's video gaming industry. Especially Edge and their claiment to be the best. Actually, Retro Gamer's still the same nowadays. Edited by high voltage, Sat Oct 18, 2014 7:06 AM. Bob Armour working on 7800 Gauntlet claim turned up in 3 publications. Jaguar Quake was 30% complete-yet years later i'm still waiting/looking for proof. I used to subscribe to a lot of UK mags, simply stopped supporting them, as whats being stated t is so poorly researched the publications are'nt worth my cash. Working with sites like Unseen64, C64GTW, Konix Site and here, you soon discover the reality behind so many missing game claims etc. What i would of liked to have seen UK mags over the past few years do, is actually look into a lot of the claims made by UK press years before. I.D have worked with likes of RG before, so why was'nt the question of Jaguar Quake put to them? mystery could of been cleared up there and then. Druid has been covered in various mags, yet no-one seems to be able to answer the question of IF Druid II really was ever started on the A8. The 7800 has had countless features, yet again, no-one seems to be able to answer the claim of a team of Ex-Imagine coders being contracted to produce games for it. We found out about 7800 Paperboy on here, thanks to Andy coming forward, it was never mentioned in any of the publications i paid good money for.